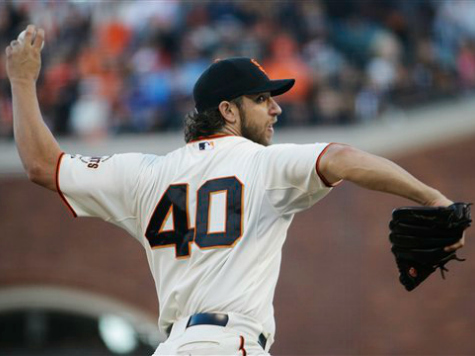 SAN FRANCISCO (AP) — With every pitch, Madison Bumgarner etched his place among the World Series greats. Hardly menacing on the mound, Bumgarner was simply untouchable — again — as “MVP! MVP!” chants broke out in the late innings. And by the time the 25-year-old from Hickory, North Carolina, closed out his second win in a week, he had evoked memories of Bob Gibson, Sandy Koufax, Curt Schilling and the top October aces of all-time. Joined them, and maybe even passed them. Who else has gone 4-0 in four World Series starts with an 0.29 ERA? Throw in only 12 hits in 31 innings, along with 27 strikeouts, and that adds up to the very definition of Big-Game Pitcher. On this evening, he fanned eight without a walk and never was in trouble, becoming the first pitcher to toss a World Series shutout since Josh Beckett’s clinching gem for the Florida Marlins in 2003 at Yankee Stadium. The Giants’ work isn’t done yet. To lock up their third crown in five years, they’ll need to win in Kansas City. Jake Peavy gets the first chance to seal it for San Francisco when he starts Game 6 at Kauffman Stadium on Tuesday night against rookie Yordano Ventura. If the Giants don’t win then, there was always this possibility: Bumgarner out of the bullpen in Game 7. Hunter Pence once again was in the middle of things for Giants. He singled off James Shields in the second and scored on a groundout by Crawford, who finished with three RBIs. Later, the enigmatic Pence accidentally threw his bat past the mound while striking out, and seemed to apologize to Shields. Pence added another hit in a three-run eighth, making him 9 for 19 in the five games. Postseason star Pablo Sandoval also singled twice. Juan Perez broke it open with a two-run double off the top of the center-field fence in the eighth off Wade Davis and scored on a single by Crawford. Bumgarner won for the fourth time in this postseason, and this blanking bookended the four-hit shutout he threw at Pittsburgh in the NL wild-card game. Durable, he’s thrown 47 2-3 innings this October, trailing just Schilling’s 48 1-3 in 2001 for the most in a single postseason. Given an early lead, Bumgarner was in control. He surely didn’t need much of a cushion, and looked even better than he did in winning the opener in Kansas City. And on the rare occasion when the 6-foot-5 Bumgarner made a mistake, failing to cover first base on a grounder to the right side, his defense bailed him out. Toward the late innings, it appeared that only a lightning strike could rescue the Royals, perhaps a home run out of nowhere. Not happening — this was the third straight game without either team hitting a homer, the longest streak in the World Series since 1948 when the Boston Braves and Cleveland began with a three-game drought, STATS said. Exactly why the man nicknamed MadBum is so dominant isn’t easily apparent. Royals cleanup man Eric Hosmer said before the game that Bumgarner’s “cross-body” delivery is tough to pick up. Bumgarner definitely has an impressive whip, along with an imposing WHIP in the World Series. His walks-plus-hits ratio per inning is incredible. Bumgarner certainly excels at keeping hitters swinging at shadows by changing speeds. Kansas City batters chased balls that bounced as well as high ones out of the strike zone. After Salvador Perez led off the second with a single — he homered in Game 1 for the lone run off Bumgarner — the slow-walking lefty who never seems to be in a hurry made quick work of the Royals. Bumgarner struck out the next three batters, all swinging. He was at his best against pesky Omar Infante on three pitches: a 76 mph curve, a fastball at 91 and a slider at 86. About the only thing Bumgarner didn’t do was get a hit. He takes pride in his plate prowess and launched four home runs this season, including two grand slams. Bumgarner went 0 for 4, leaving him hitless in 22 postseason at-bats. Yep, he’s still got some work to do. Royals: Ventura will become the fourth rookie to start twice in a Series since 2000, joining John Lackey, Justin Verlander and Michael Wacha. Giants: Peavy started in the World Series last year for the champion Boston Red Sox. He took the loss last week in Game 2, and is 1-4 with a 7.05 ERA in eight career postseason starts. Of the 41 previous instances the World Series was tied at 2 in the best-of-seven format, the Game 5 winner has won the title 27 times.